The number one way C.J. 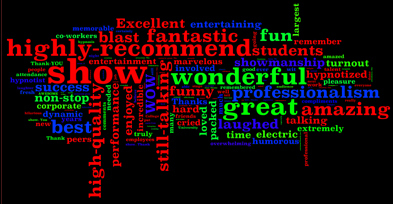 's show is described is as "Amazing"! It's a complete theatrical experience as it includes the drama of the induction, comedy from the routines, music, dancing, surprise and mystery. It's a show that your students will talk about for years to come. Ethics and Principles are core to C.J. 's presentations. He treats everyone on stage with him with respect and takes care of his guests (your guests) better than anyone in the business. His core belief/principle about Hypnosis is that the show is all about the guests on stage and they are always made to be the focus of the laughs and the applause. Laughs never happen at the expense of a guests dignity. C.J. views his job as "empowering people to be superstars, not making them look foolish." Before during and after the show C.J. is one of the friendliest, most accessible acts in the college market. C.J. 's show is hilariously funny, but always remains family friendly and clean. It's why so many religious schools bring C.J. to campus. It doesn't have to offend to be hilarious! C.J. has the experience and confidence that only thousands of shows can give. No matter what situation may arise, when you've done as many shows as he has, it's familiar territory. In the book "Outliers", Malcolm Gladwell says it takes 10,000 hours to become a master. Very few performers can, by this standard, be called masters, but C.J. truly can be. He's put in the time in front of live audiences so his show is second nature, he's encounter just about every situation, and he knows how to handle them. Why would you trust your students to anything less than this level of mastery? Growing up the number one lesson repeated to him by his mother was "A man is only as good as his word". This core value runs through everything that C.J. does. If he says he'll be there... he will. If he says he'll do it... he will. You won't get broken promises, cancelled shows or unfulfilled promises from C.J. If he says he'll do it... it will be done. 15 years ago, when C.J. first got into the college market, he learned right away that it wasn't enough for a school to hire great entertainment, they had to let people know that the entertainer was on campus. No act in the college market makes this easier for you than Comedy Hypnotist C.J. Johnson. In fact, it's likely that you'll say "this is the best promo kit we've ever gotten". C.J. even wrote, with business partner Brian Brushwood, the book "Pack The House" which is all about getting people to attend your college events. You'll get a free copy of this book when you book a show and C.J. even has a lecture available for your board and other campus organizations and it's available at a discount when he's on campus for your show. This great promo kit is just one more reason that colleges bring C.J. back to campus year after year after year. C.J. is represented in the college market by Carol Studer at "Everything But the Mime". The agency has been awarded "Agency of the Year" by APCA a record 6 times. The agency's mission statement is ". . . to represent genuinely nice people who offer high quality entertainment at affordable prices." They're doing a great job as everyone on the EBM roster is not only a top notch performer, but someone who is genuinely nice. C.J. is proud to be a part of this family of entertainers. The experience of thousands of shows means that C.J. has probably worked a similar event and a similar venue over the years and can adapt to most situations. His technical demands are simple. He's got to be seen and heard and most of all, the people on stage have to have ample room to perform and be safe. Other than that, C.J. can make most environments work for a show. You have enough to worry about at an event, C.J. will clearly spell out his technical needs (and even provide pictures to help the non-technical) in the contract rider. At the show, C.J. will stealthy run his own music cues through hidden remotes - meaning you only need to provide an input for the laptop he's controlling, set a level, then sit back and enjoy the show! C.J. will also need a high quality, wireless microphone. Don't have one? No problem, let C.J. know and he'll bring his own. You'll never come across an easier to work with act than Comedy Hypnotist C.J. Johnson. Everything about the way C.J. runs his show and his business is designed to make YOUR life easier the day of the event so you can enjoy the show too. While C.J. is certainly not the "cheapest" hypnotist in the college market he's a long way from the most expensive too. Few hypnotists in the college market, for that matter, few hypnotists PERIOD, have the experience, awards, television and other credentials that C.J. Johnson has and yet his pricing for college events is surprisingly competitive. "C.J. is a College Programmers Dream"
C.J. 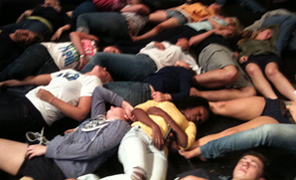 Johnson's College Hypnosis Show is perfect entertainment for the college audience. There's drama, intrigue, mystery, and lots and lots of comedy. All with your students as the star of this hilarious show. We can assure you that C.J. Johnson's Comedy Hypnosis show will be one of the highlights of your campuses programming this year. And once you've had C.J. on your campus you'll invite him back again and again! C.J. has experience in front of audiences as small as 40-50 and as large as 20,000, from cafeterias at lunch-time to fully equipped 2500 seat theaters and stadiums. No matter what size audience you typically get at your school or what type of venue is available, C.J. will put on the best show possible for your audience. In fact that's his special gift - pulling the best performances possible out of every volunteer on stage. From the minute you contact us, you'll discover why C.J. is one of the most in demand hypnotists in the college market. An awesome show combined with excellent customer service, amazing support before, during and after the show, and very easy technical needs make C.J. Johnson the ideal college performer. Watch the testimonials to the left, watch the demo video (and listen to the roar of the audience) and imagine that same reaction on your campus. Then fill out a contact form and C.J. will have his college agent contact you with more information. Competively priced - even a bargain! Many hypnotists charge from $750-$2500 more than he does. Why? They have to pay for all those full color ads you see in the college magazines - or more to the point - YOU have to pay for them. You won't see us running up our fees to do "image based" advertising. We'd just as soon stay competitively priced and go easier on your budget. In the end we make the same profit and you get to bring more programs to your campus. 60-80% of all schools who book CJ have invited him back to campus again within 2 years! Why? Because the show in highly entertaining and constantly changing. In fact, CJ keeps a database of all the routines he does at your school and then, when returning, makes sure that at least 1/2 of the routines are new the next year! Not many acts are as committed to your long term satisfaction as CJ is, and it shows..
C.J. understands that his job on campus is to make YOU the stars - a job at which he excels. As a member of NACA or APCA you can take advantage of cooperative buying and save some big money. Check the schedule to see if coop opportunities exist in your area, if not - you can start the block yourself! We regularly reward schools who initiate blocks of shows with discounts or free workshops. If you have schools you work with - get them to be a part of your block of shows and you'll stretch your budget to the max! If for any reason, within C.J. 's control, you are not pleased with the show - you don't have to write a check! C.J. 's goal is total satisfaction. From the time you schedule the show until the auditorium is emptied at the end of the night, C.J. strives to overwhelm you with the level of support from his office. You'll get a great "Show Support Kit" which includes posters, press releases and promotional ideas, teasers (when schedules permit) and our years of experience in promoting events. This kind of guarantee assures you that C.J. will do everything in his power to make sure you're happy with his show. After all - his check is on the line at every performance. All of CJ's College Hypnosis shows are booked through Everything But The Mime.